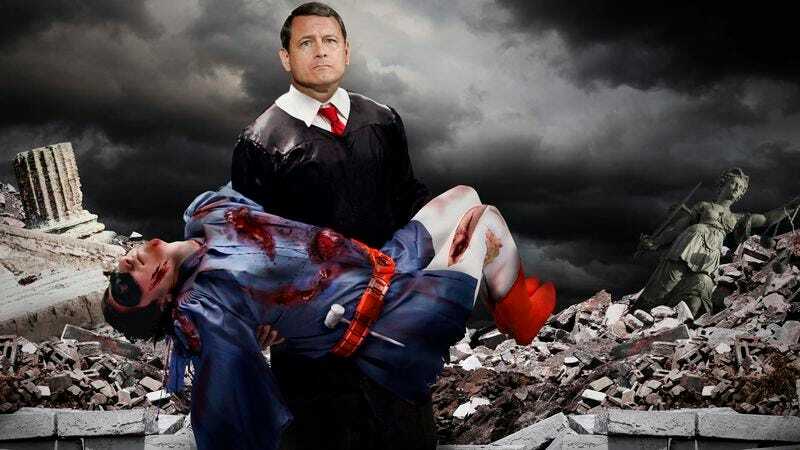 Chief Justice John Roberts cradles the body of his beloved sidekick, Kid Justice. WASHINGTON—The United States Supreme Court was rocked by tragedy Thursday when the judicial branch’s longtime sidekick, Kid Justice, was brutally murdered by the nefarious Dr. Contempto. Kid Justice, who sources confirmed was the alter ego of mild-mannered Supreme Court fellow Jimmy Randall, reportedly vaulted through the air and intercepted a missile launched by Dr. Contempto in mid-flight, selflessly sacrificing his life to save Chief Justice John Roberts from certain death. The villainous Dr. Contempto, sworn enemy of the Court. Thursday’s deadly skirmish began outside the Supreme Court Building, popularly known as the Justice Chambers, when continuing arguments in the case of Horne v. Department of Agriculture (No. 12-123) were interrupted by an aerial invasion by Contempto and his fleet of sky-skimming Obstructrons. Contempto, who was known as scientist Wade Walters before losing a landmark eminent-domain case that forced closure of his laboratory, had long vowed that the Supreme Court would suffer for their insolence, but never succeeded in permanent injury to the deliberative body until Thursday’s showdown. The deranged genius has attempted to destroy the Supreme Court dozens of times since the prima facie clash in 1987, introducing anti-jurisprudence viruses to the building’s water supply, and the notorious incident of replacing several justices with robot duplicates during the 2000 election crisis. A preemptive sortie of Court-launched Docket Rockets reportedly caused little damage to Contempto, but bought time, allowing the justices to change into their fighting robes and charge the crystalline gavels that provide them with their superhuman judicial powers. A lengthy and spectacular fight up and down the steps of the Supreme Court Building followed, filled with explosive punches, blasts with optical beams, and protracted oral arguments. Contempto reportedly immobilized several justices with a high-energy Deadlock Ray, halting all judicial activity in its path and preventing the deliberative body from moving forward in any capacity. Contempto then revealed his coup de grace in the form of a medium-yield tritonium missile that was fired directly at Roberts. While Justices Sotomayor, Breyer, and Scalia writhed and spoke very slowly under the ray’s power, Kid Justice thwarted the attack by throwing himself into the deadly weapon’s path. The tragic event marks the first death of a sitting sidekick in Supreme Court history, and the first murder of a Court member since the 1996 time-travel incident during which Justice Antonin Scalia was killed by Stephen Douglas but replaced with Universe-H Scalia. The Supreme Court has since issued an 8-1 decision ruling that Dr. Contempto will pay.